What Are Rockfall Protection Systems? Rockfall protection can be either active or passive. The main function of rockfall protection is to prevent and control rocks and debris from falling. There are several products available these days that can be used as rockfall protection systems. In fact, they're widely used in new developments and in areas where slopes have not been completely stabilized. Rockfall protection is somewhat of an imperfect science that requires special skills and specific installation procedures. There are no real rules of thumb when you're using rockfall protection systems due to the atypical behavior of rocks and soil stabilization measures. 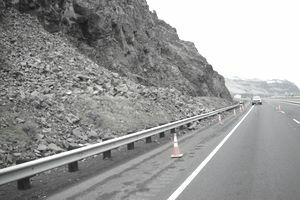 Active mitigation is necessary when there's a real danger of falling rocks. The designed rockfall protection systems must be capable of absorbing the impact of the falling rock and must be able to contain it in such a way as to reduce danger and present safeguards for people and property. Passive mitigation is necessary when the scenario is intended as a preventive way of controlling rockfalls. This method is usually used ​in areas that are not fractured or where slopes have already been worked with slope stabilization measures. Hexagonal mesh rockfall protection is different from gabion mesh. The hexagonal mesh is a double-twisted safety net that provides greater restraint from stretching. It allows the rock to move freely inside the mesh when it's properly installed. The double twist on the mesh also ensures that the net won't fail if one wire is cut. Anchoring the mesh to the surface can be accomplished by different procedures and depends on the soil characteristics. This method is recommended for rocks varying in size from 18 inches to 2 feet in diameter. Some soil engineer experts have claimed that the HEA panel might be considered a passive intervention because it acts after a fall and not before. HEA panels are manufactured using twisted cables. The HEA panel is widely used on unstable slopes and areas that are prone to alteration. The combination of a high resistance cable with a soft steel wire makes it a perfect solution for handling both large and small rocks. The HEA panel provides the best performance under static load and stress dissipation to the anchorage points. Soil embankments are used as rockfall protection systems when it's impossible to install drapery or mesh systems. In construction areas that are inaccessible or where part of the slope can't be reached, soil embankments might provide the safety protection that you're looking for. Rockfall soil embankments built using local fill material to create a "green" embankment will reduce the environmental impact of the system. This type of protection can withstand high energy impacts. The advantages of these systems are their low installation cost, the minimum maintenance that's required, and the integration of local resources with the environment. Soil embankments use a wire mesh evaluated by AASHTO and FHWA that forms the facing element and the reinforcement section.